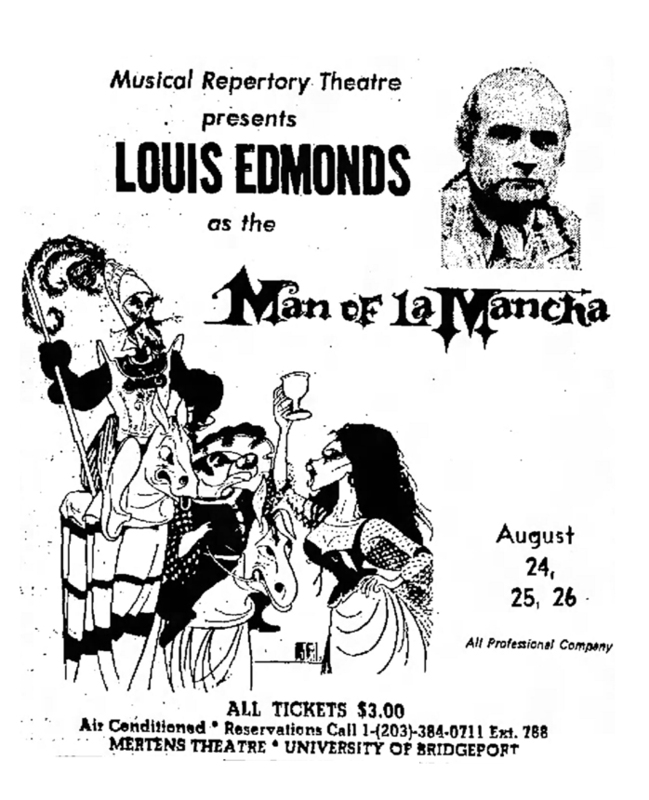 In 1973, Louis Edmonds took the stage in Bridgeport, Conn., to play the mad knight Don Quixote in MAN OF LA MANCHA. While there, he spoke to the local newspaper about the production, and also went into surprising detail about his life and career. There's a touch of sadness to the interview. A few paragraphs after noting that the success of DARK SHADOWS didn't lead to more television work, he went on to say: “Acting is a glorious career. It offers dignity and good money if you are successful and if you are not, you better get out." Luckily, stubbornness prevailed. Edmonds continued to entertain people for decades to come, stopping only when he was physically unable to take the stage. I've been sitting on this interview for a while. 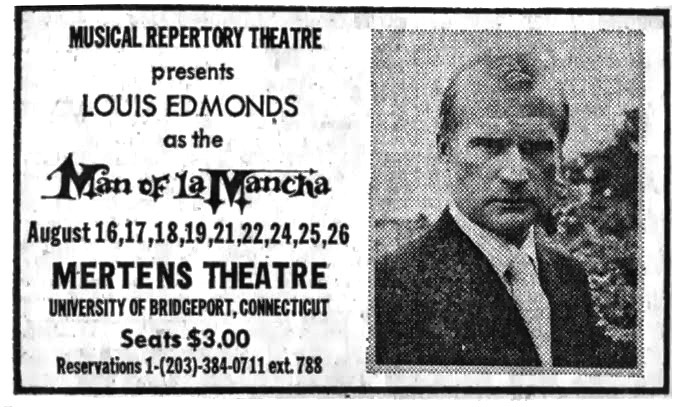 Edmonds would have been 92 years old today, which seems like a good enough excuse to share it. I've cleaned up a few of the factual errors (the writer cites Thornton Wilder as the author of "The Importance of Being Ernest," for example) but have left the rest of the article untouched. I added a few hotlinks within the article, for those of you interested in learning more about some of the productions discussed here. About two-and-a-half weeks ago, actor Louis Sterling Edmonds left his Setauket, L.I., home on his bicycle and rode to the Port Jefferson ferry. 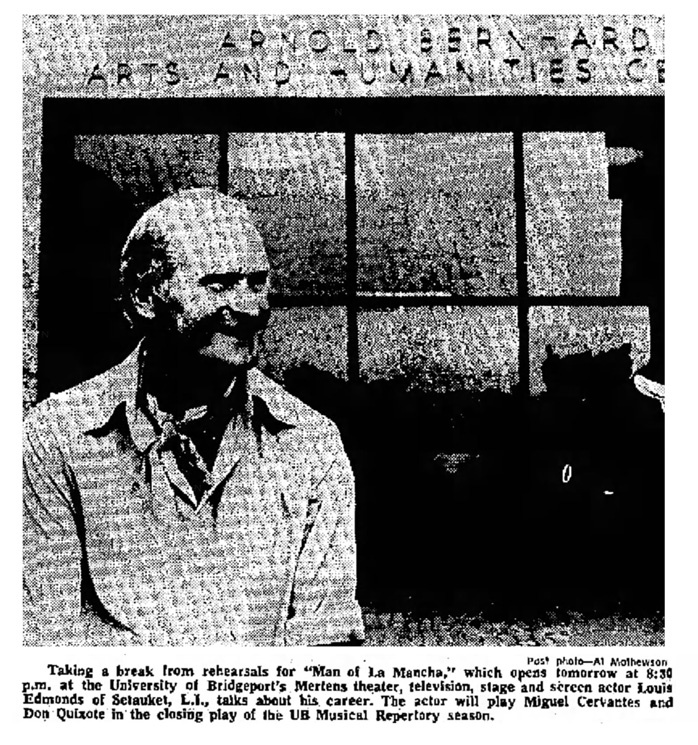 When he arrived in Bridgeport an hour-and-a-half later and a little windblown, he hopped on his bicycle and rode to the Mertens theater at the Arnold Bernhard Arts and Humanities Center of the University of Bridgeport, where he started rehearsals for the final play of the UB Musical Repertory theater season. His carefree entry and nature are similar to Don Quixote taking off on a weatherbeaten horse for another adventure. 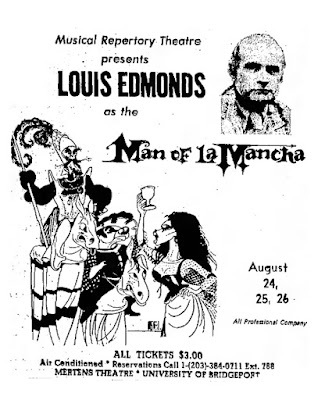 Louis Edmonds is an actor whose personality complements the roles he will create "Man of La Mancha” both as Miguel Cervantes, the author of “The Ingenious Gentleman, Don Quixote of La Mancha,” the book on which the play is based, and as the character, Don Quixote. The play will open tomorrow at 8:30 p.m. in the Mertens theatre and will run Aug. 17, 18, 22, 24, 25 and 26. The Baton Rouge, La., native said he loves singing. This is not the first musical he’s done. 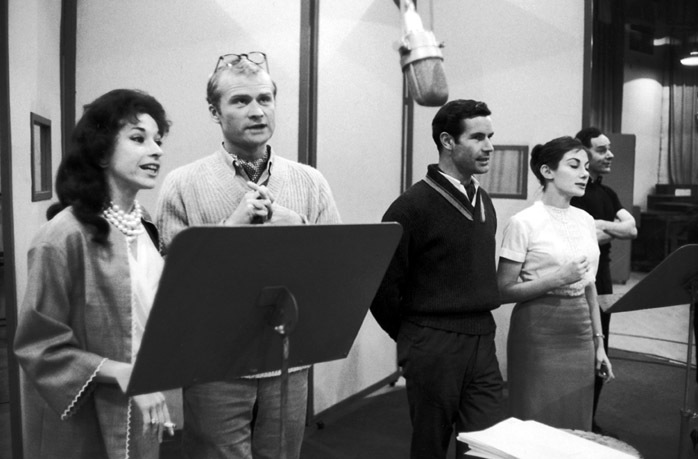 From left, Gerriane Raphael, Louis Edmonds, John Irving and Leila Martin in the studio for ERNEST IN LOVE. 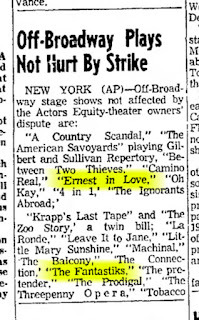 He also played in two other off-Broadway musicals, “Subways Are for Sleeping” and “Royal Flush,” the latter “which closed in Philadelphia as it deserved to,” he added. “It helps in strengthening the muscles in your throat,” he explained, noting that he wouldn’t be caught on Madison Avenue in New York doing voice exercices. “I am sorry I haven’t had more musical opportunities in my rather spotty career,” he admitted. “I studied voice in New York City under Emy Joseph. 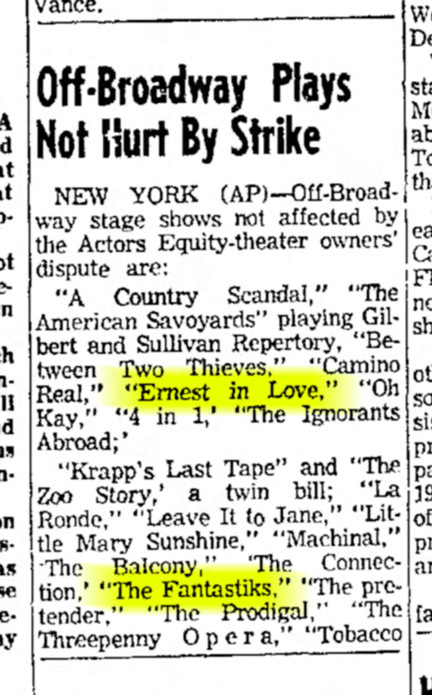 I guess it’s part of my Southern upbringing but I always called that gray-haired, beautiful blue-eyed lady, ‘Miss Emy,” the casually dressed actor said. 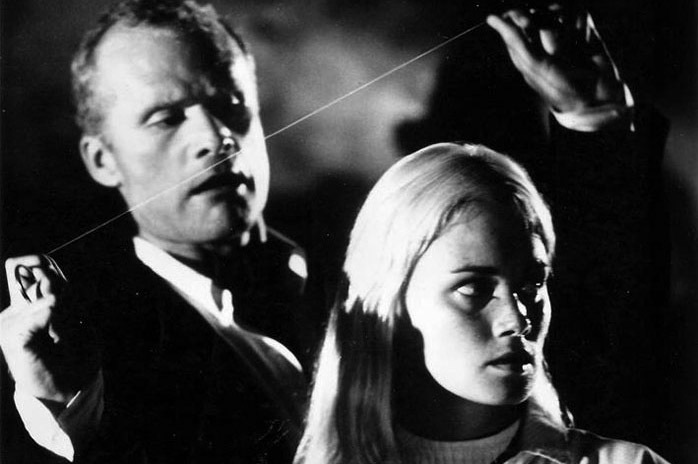 Louis Edmonds and Andrea Dromm in COME SPY WITH ME, 1967. “I feel at home in both the theater and television, but I cannot really answer whether I prefer the theater to the movies because I’ve never had the good fortune of being in a good movie,” the blond, blue-eyed actor said. At Carnegie Tech, he said “I received good training in the classics, like Shaw, Chekov and Shakespeare. “I made my Broadway debut under the direction of Sir Tyrone Guthrie in Leonard Bernstein’s ‘Candide’ and I was not singing in those days and was hired strictly as a speaking actor. “I feel at home in Shakespere,” he said of his many performances as Antony in “Antony and Cleopatra” and his performances in “A Midsummer Night’s Dream” in Philadelphia. “Shakespeare is a beautiful world to work in. The climate in Shakespeare is so expansive and free, if you have the voice, speech training and leather lungs necessary for some of those epic monologues. It’s an absolute joy to bring meaning to a play and make it alive for the people,” he said. “My sister and brother-in-law and two nephews came to see ‘A Midsummer Night’s Dream’ in Philadelphia,” he said. “When they came backstage they had tears in their eyes because they laughed so much. “It’s a wonderful feeling to have people get the message of a play and be responsive to an actor’s interpretation. It’s like being turned on,” he said. “Yes, people do recognize me as the actor who played Roger Collins for four and a half years in the television series, ‘Dark Shadows,’ but they do not identify me with just that type of role,” he said. 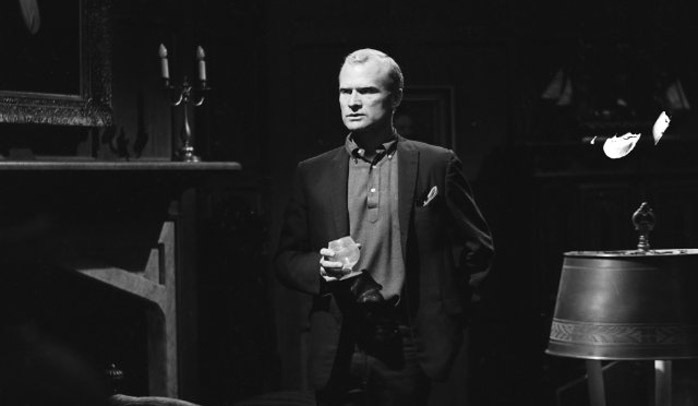 Louis Edmonds on DARK SHADOWS. "I was the old conservative in the series but it was fun.” He explained that when he first started in the series he was cast as a “heavy” and was expected to be written out of the cast in the first 13-week cycle. However, the executive director, Dan Curtis and he got along well, and the part was made to atone for his beginning character in the series, and he was accepted as a regular by the viewers, he said. His first professional job in the business was in 1946 in Woodstock, N.Y., when he was in “Candida.” He went into the Navy Air Corps shortly after and thee years later was honorably discharged and resumed his career. “I’ve been in the mean world ever since then,” he said. “My favorite part was playing ‘Cyrano de Bergerac’ at the Great Lakes Shakespeare festival and I think Don Quixote will also be a favorite. I hope I’ll be able to do ‘Man of La Mancha’ other places. It’s a beautiful part,” he said. “Acting is a glorious career. It offers dignity and good money if you are successful and if you are not, you better get out,” he said.